DoubleTree Hotel Chocolate Chip Cookies Recipe! 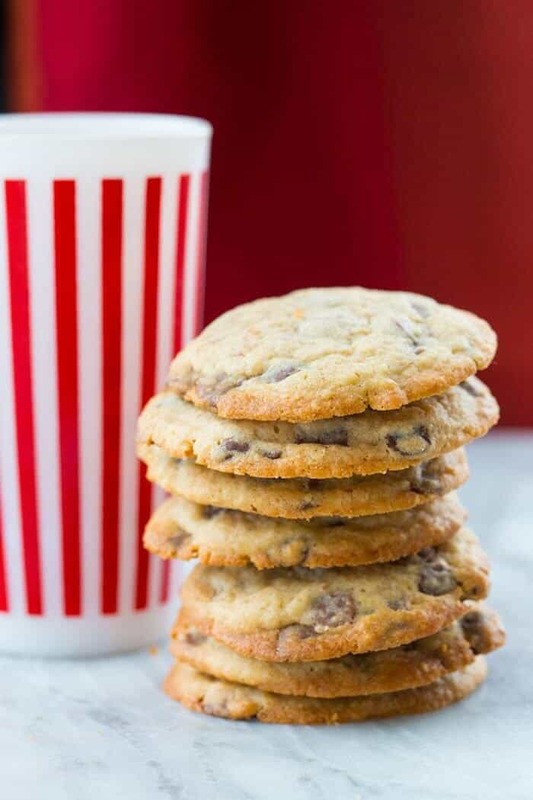 If you have ever stayed at the DoubleTree by Hilton hotel chain you’ll know that they are famous for their warm chocolate chip cookies upon your check in to the hotel! Now you can make them at home! The DoubleTree Hotel Chocolate Chip Cookies are Legend! What makes the DoubleTree chocolate chip cookies so special? Well, it does have to do with the fact that they are associated with a hotel chain, which in itself has connotations of vacation and happy times. Even if you go to the opposite of that, a warm chocolate chip cookie at the end of a long day of travel does the heart and soul good! How about some crazy cookie facts?? Over 65,000 cookies are made each day! That’s 25 million a year and 250 million cookies all in all! The cookies are baked fresh daily and every hotel. Every DoubleTree hotel has the same recipe so that they are all the exact same cookie no matter where in the world you are! How many chocolate chips? Over 1 million a year! And I thought that I baked a lot! That sounds like a lot of cookies but the cookie program only started in the 1980’s. Still, that’s a lot of cookies! Each cookie is 2 ounces and has at least 20 chocolate chips! The hotel ones, that is. I can’t guarantee that mine have that many but there is 3 cups of chocolate chips compared to the usual 2 cups of semi-sweet chocolate chips in basic cookies. Check out these two making their version of the DoubleTree Chocolate Chip Cookies! They use walnut in theirs, while I skipped them in my recipe. That’s only because my family doesn’t like walnuts ( they are crazy, I know it.) I would add all of the walnuts in the world to these cookies! I am sure that the cookie dough for the cookies is refrigerated at the hotel at LEAST one night, maybe even two. The dough wouldn’t be prepped that day and it’s a well known cookie fact that refrigerating the dough amplifies the taste. The flavours have time to meld and come together overnight. I’m honestly never patient enough. The oats are the key! It sounds so weird but apparently it’s the ground oats that make the DoubleTree Hotel Chocolate Chip Cookies what they are. If you don’t have a food processor, you can use a blender, I actually used my hand immersion blender in a large cup and it worked like a charm! You want to get the oats very fine. You need LARGE golf ball sized cookies if you are replicating the cookies exactly! And remember, 20 chocolate chips! I expect you to count them! I kid, I kid. I loved the oat flavour in these without the texture of the rolled oats, it’s not wonder people love them so much! It’s something that you have to try to see exactly what it’s like! Here’s some other cookie recipes to try! Pin This To Your Cookies Board and Remember to FOLLOW ME ON PINTEREST! 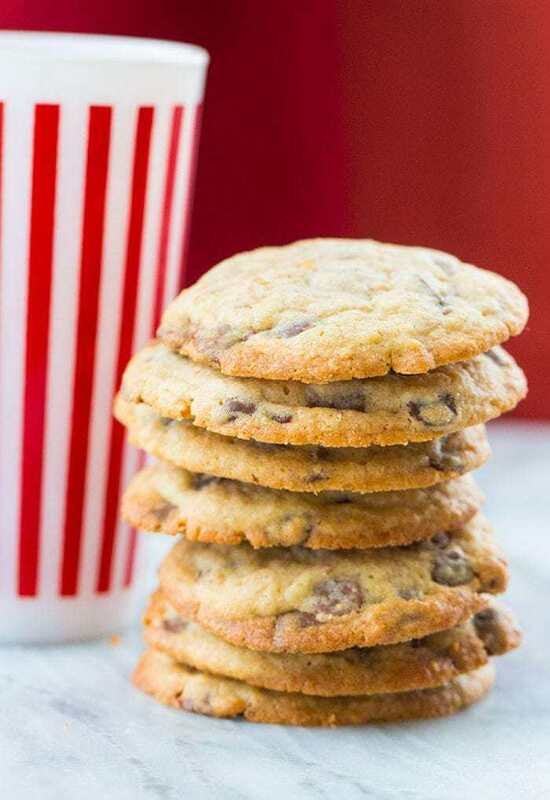 Copycat DoubleTree Hotel Chocolate Chip Cookies Recipe! 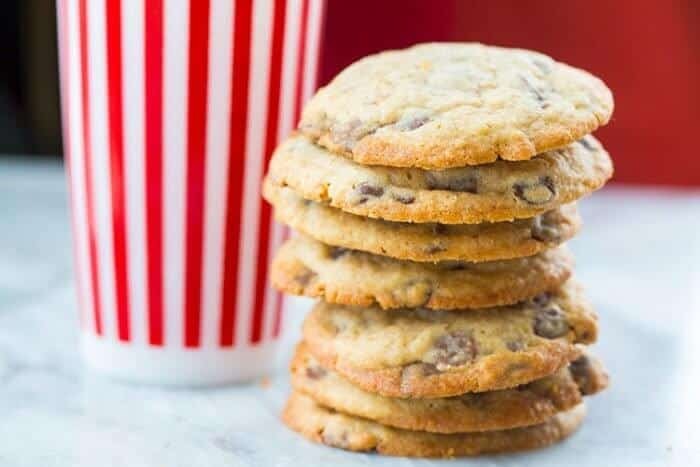 If you have ever stayed at the DoubleTree by Hilton hotel chain you’ll know that they are famous for their warm chocolate chip cookies upon your check in to the hotel! Grind oats in a food processor or blender until ground fine, I use my immersion blender in a large cup! Combine ground oats with flour, baking soda, salt and cinnamon in a medium sized bowl. In a separate bowl combine the butter, sugars, vanilla and lemon juice and mix with mixer until combined. Add the dry ingredients to the wet and mix in completely. Add the chocolate chips and walnuts (if desired) and mix them in by hand until ingredients are well mixed. Use a large cookie scoop or roll the dough into golf ball sized balls and place on un-greased cookie sheets 2 inches apart. Bake for 12-14 minutes or until the cookies are baked around the edges yet still slightly under baked in the middle. This is how you get them chewy! Remove and cool on the cookie sheets. Store in an airtight container for 2-3 days at room temperature. I suspect that the hotels refrigerate the cookie dough overnight for one OR two nights, feel free to try it! I figure it will be perfect if I follow your recipe to the dot the next time.